Ovenden, pictured, says local manufacturing in Russia is "starting to pay dividends." MOSCOW (Bloomberg) -- Ford Motor Co., which spent more than $1.5 billion in the past five years to build cars and engine factories in Russia, is studying new investments in the country in a bet on economic recovery. The national car market could still become Europe's biggest, and Ford wants to be prepared when demand recovers, said Mark Ovenden, CEO at the U.S. automaker's Russian joint venture, Ford Sollers. Russian consumers may be more resilient than their Western counterparts, he said. "We will continue to invest, and we are thinking now about what our next investment cycle in Russia will be," Ovenden said in an interview near Moscow this week. "We see Russia as a long-term play." Recession helped send the country's passenger-car market, once the second-largest in Europe, down almost 40 percent last year. Ford stuck to its spending on new models and plants even as its rival General Motors Co. pulled out of the country. The commitment paid off in the first quarter, as Ford sales jumped 93 percent amid a market decline of 17 percent. Ford Sollers introduced "five decent products" last year, and this along with more local manufacturing is "starting to pay dividends," Ovenden said. The company started producing the new Focus, Mondeo, Fiesta cars, Transit van and Explorer SUV in Russia in 2015. The company also makes the Kuga and EcoSport SUVs in Russia. 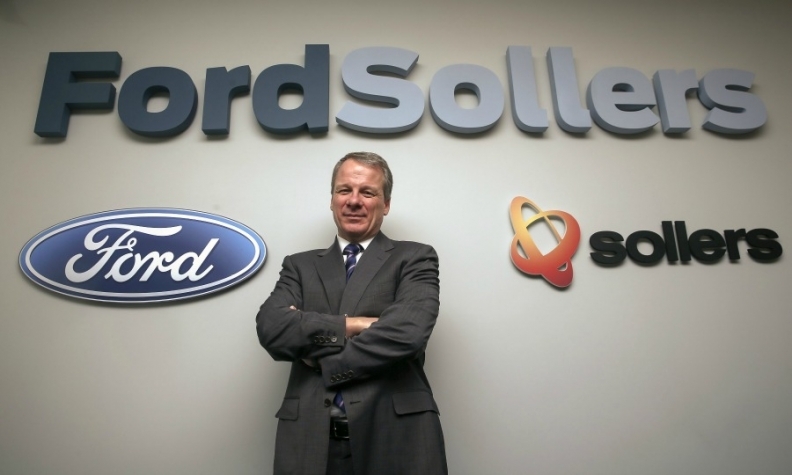 Ford Sollers doesn't expect an annual sales gain as large as the first-quarter jump, Ovenden said. The market will probably decline another 5 percent this year to 1.53 million new cars sold, according to the Association of European Businesses in Moscow. Ford Sollers is also considering exporting vehicles from Russia due to the weakness of the ruble compared to other currencies, Ovenden said. If the European market keeps growing, "there may be export opportunities, driven by the shortage of capacity in western Europe," he said.